Read our past newsletters to hear more about our advocacy and events. Thanks! This video below features highlights from our patient picnics this summer, and our friends at The CementBloc created it for us pro-bono, in addition to making logo and identity for the picnics, banners, bean bag toss games, flyers and more to make this a wonderful picnic. Many sponsors supported the picnics, which will be featured on our donors page. Photos from our 2014 Autoinflammatory Picnic Days this summer are on this flikr autoinflammatory group page. Picnics were held in Metro NY area, Ohio, Northern & Southern California. 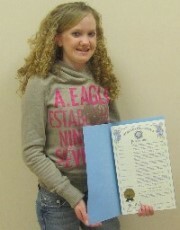 J.R., a teen with CAPS from Nebraska was successful in 2011, and also in 2010 with her efforts to have the Governor of Nebraska issue an official proclamation in honor of The NOMID Alliance to recognize Rare Disease Day in the State of Nebraska! Thanks to all that wrote to their governors to get proclamations in their states, including A.R. in Arkansas. Rare Disease Day was recognized in all states in 2011, and officially recognized by Congress this year too. 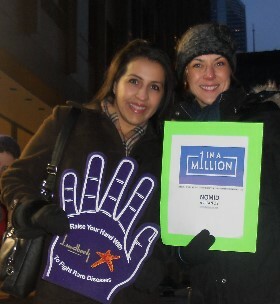 Dorelia R., one of our board members and Michele M, a parent attended the Rare Disease Day media event and rally in Chicago very early on a cold winter morning for Rare Disease Day 2011 on February 28th. 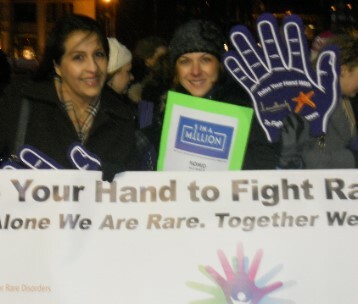 Thanks for supporting rare diseases, and representing The NOMID Alliance! We really appreciate it. The NOMID Alliance were exhibitors at the March 23, 2011 Pediatric Rheumatology Update at NYU in New York City. Colleen Paduani represented us well, and there were many excellent presentations, including one by Dr Goldbach-Mansky. 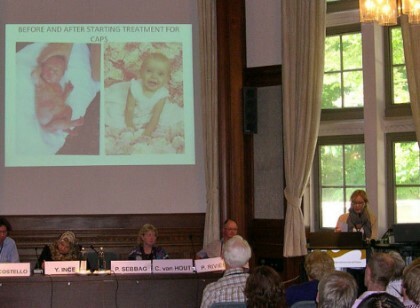 Colleen Paduani did a great job representing The NOMID Alliance at Autoinflammation 2010 in Amsterdam, the Netherlands and also gave a wonderful presentation at the concurrent Patient's program. She was able to meet many other organizations from all over Europe that help patients with autoinflammatory diseases. She met many of the doctors that care for people with these diseases, and patients that had come to the program to learn more about these rare diseases, and meet others like them. This benefit for the NOMID Alliance on July 25, 2009 in Newburgh, NY was a great success and we thank all that participated and supported the cause. CAPS Brochure and Scientific Poster was presented at the FMFSAID 2008 Congress in Rome. The CAPS brochure was distributed to doctors from around the world at the FMFSAID 2008 Congress in Rome, Italy April 4-8, 2008. A special thanks to Dorelia Rivera, one of our board members, that attended the congress to promote the program, distribute CAPS brochures and present a scientific poster. For more information about this event, go to www.fmfsaid2008.com. Deep and sincere thanks to Dr. Martini and the organizers and scientific secretariat of the FMFSAID congress for facilitating this opportunity and admission to this great congress. The NOMID Alliance was present in the exhibition hall at booth #1544 at the 2008 American College of Rheumatology Conference in San Francisco, California October 26-29th. We distributed the CAPS brochure to increase awareness of NOMID, MWS and FCAS amongst thousands of rheumatologists at this important conference. We met many doctors that have CAPS patients, and even more that had never heard about these syndromes until they visited our booth! Thanks to all that visited our booth. The NOMID Alliance appreciated the non-profit rate booth that was offered to us by the American College of Rheumatology and the organizers, Slack Inc. Thanks so much! This event in Bowling Green, Kentucky was a wonderful success! Thanks for all your support. The Advertising Agency, Earnhart + Friends, was gracious enough to host this exciting fundraising event! All proceeds benefited THE NOMID Alliance.